He says it's misleading to think that codebreaking is about some lonely genius suddenly understanding the meaning of a word. What works more often is patient teamwork and the sharing of theories. Putting the images online should accelerate this process. But this is painstaking work. So far Dr Dahl has deciphered 1,200 separate signs, but he says that after more than 10 years study much remains unknown, even such basic words as "cow" or "cattle". He admits to being "bitten" by this challenge. "It's an unknown, uncharted territory of human history," he says. Dr Dahl suspects he might have part of the answer. He's discovered that the original texts seem to contain many mistakes - and this makes it extremely tricky for anyone trying to find consistent patterns. This first case of educational underinvestment proved fatal for the writing system, which was corrupted and then completely disappeared after only a couple of hundred years. "It's an early example of a technology being lost," he says. "The lack of a scholarly tradition meant that a lot of mistakes were made and the writing system may eventually have become useless." 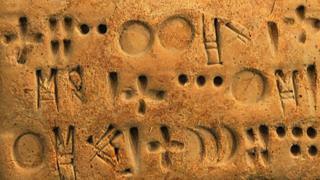 Making it even harder to decode is the fact that it's unlike any other ancient writing style. There are no bi-lingual texts and few helpful overlaps to provide a key to these otherwise arbitrary looking dashes and circles and symbols. This is a writing system - and not a spoken language - so there's no way of knowing how words sounded, which might have provided some phonetic clues. These were among the first attempts by our human ancestors to try to make a permanent record of their surroundings. What we're doing now - my writing and your reading - is a direct continuation. But there are glimpses of their lives to suggest that these were tough times. It wasn't so much a land of milk and honey, but porridge and weak beer. Even without knowing all the symbols, Dr Dahl says it's possible to work out the context of many of the messages on these tablets. This was a simple agricultural society, with a ruling household. Below them was a tier of powerful middle-ranking figures and further below were the majority of workers, who were treated like "cattle with names". Their rulers have titles or names which reflect this status - the equivalent of being called "Mr One Hundred", he says - to show the number of people below him. It's possible to work out the rations given to these farm labourers. For the "upper echelons, life expectancy for some might have been as long as now", he says. For the poor, he says it might have been as low as in today's poorest countries. If Macbeth talked about the "last syllable of recorded time", the proto-Elamites were there for the first. And with sufficient support, Dr Dahl says that within two years this last great lost writing could be fully understood.